The driver sits in the center. Three screens await them in the cockpit. The start procedure involves roof-mounted buttons. Out the front view, everything’s about to go to warp. The 2019 McLaren Speedtail is a McLaren F1 from the future where everything flies in space. And, oh yeah, you can get the badges in gold. Well, you, actually can’t, not if you’re reading this and you haven’t already bought one. They’re all sold out. 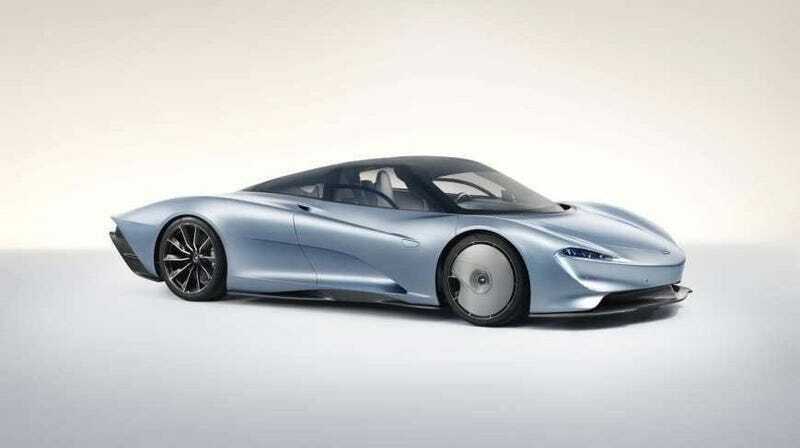 Previously known as the “McLaren BP23,” the Speedtail’s sleek shape, reminescent of the 1988 Oldsmobile Aerotech concept, should help it get up to a claimed 243 mph. No, really, doesn’t it look like the Aerotech? The British auto maker is calling this a Hyper-GT car, and has been releasing teasers for this car for nearly a year. As of right now, we know that it will feature three seats arranged with the driver in the center, it has wheel fans on the front wheels (which is awesome), it makes nearly 1000 horsepower, only 106 examples will be made, it’ll cost $2.27 million, and it’ll be the fastest and most luxurious McLaren ever built. But so far, only pictures for now, with no concrete details about power and speeds, just anticipated minimums. We’ll update more as we have it.